Update: I’m anxious to try some of Tasty Bite’s new flavors – like Aloo Palak, Mushroom Takatak, Channa Masala, and several more. I’ll continue adding to this post as I try them. I don’t eat packaged food all that often. 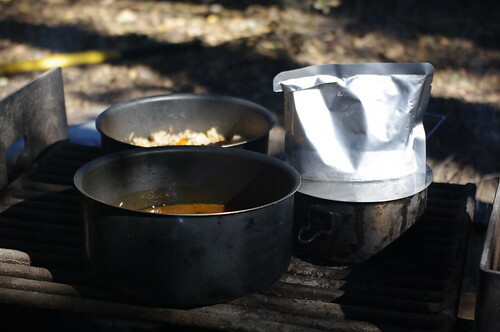 But those days that I’m camping, staying at a place with a limited kitchen, don’t want to be too intrusive in my couchsurfing host’s house, or just tired and/or lazy….it’s really great to have some instant meals that can be prepared within minutes and with basic utensils. The problem is that packaged food often leaves a lot to be desired (with regards to nutrition and taste). I was recently introduced to Tasty Bite, however, a company that has been doing a big marketing campaign in Austin these past few months. And I was pleasantly surprised! 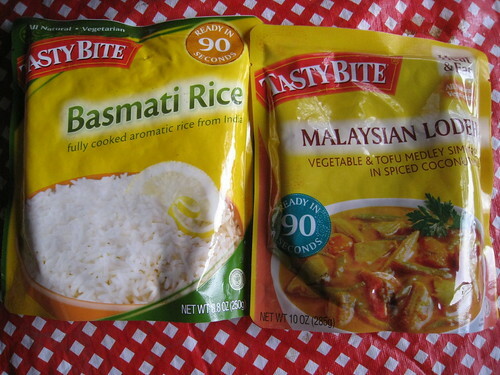 Tasty Bite meals are pre cooked dishes (primarily Indian and Asian inspired) that come in airtight, foil pouches. These packages are lightweight, easy to pack into a backpack or throw into the back of a car, and perfect for travel. They are also quite reasonably priced (at $2.99 per pouch). You can easily bring along several different Tasty Bite meals and make a large, flavorful feast within minutes. And if you’re planning a long, multi-day excursion with several people, you can even purchase the Go Camping Survival Kit. 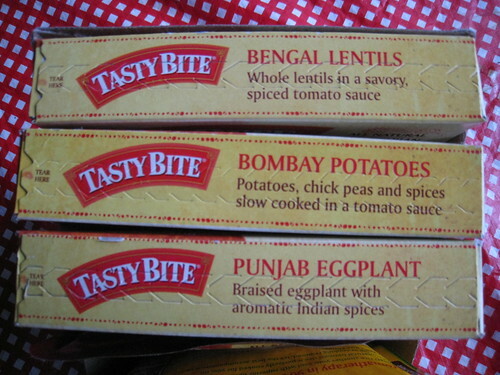 Tasty Bite offers a large variety of entrees such as Bengal Lentils, Spinach Dal, Kerala Vegetables, and many others. They even have simmer sauces for marinating/grilling, as well as precooked rice dishes such as basmati rice, garlic brown rice, ginger lentil rice, thai lime rice, and tandoori pilaf. All Tasty Bite products come in the same lightweight pouches rather than heavy cans or jars, allowing you to create flavorful meals while saving space and weight in your pack. Here you can see a list of all the Tasty Bite meals and the special diets they are appropriate for (including vegetarian, vegan, gluten-free, and kosher). I forgot to take pictures of all my meals, but I did document a few. 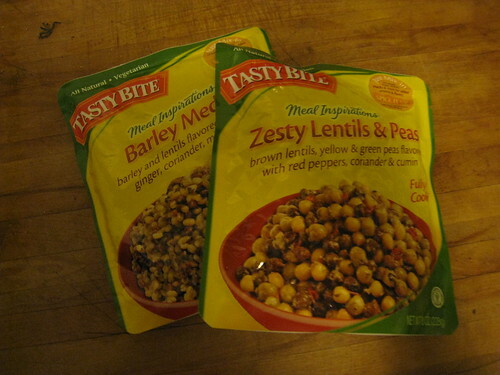 The Zesty Lentils and Peas were a great way to add additional protein to the leftovers we had at home. I just opened up the package and mixed them up with rice, steamed kale, carrots, and other vegetables. Yum. The Indian meals were my favorite though! Miguel and I recently returned from a 2-month trip to India and we bought steel thali plates with multiple compartments. 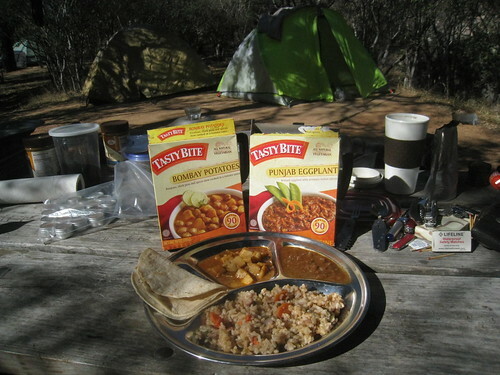 Excited to give Tasty Bite’s Indian meals a proper taste test, we brought a few food pouches along with the thali plates on a camping trip to Enchanted Rock. To prepare this meal, we simply stuck the silver food pouches into boiling water to heat them up. How much easier can it get? *And I suppose if you really don’t have a means of warming the pouches, you could even just eat them cold…as they come already cooked. 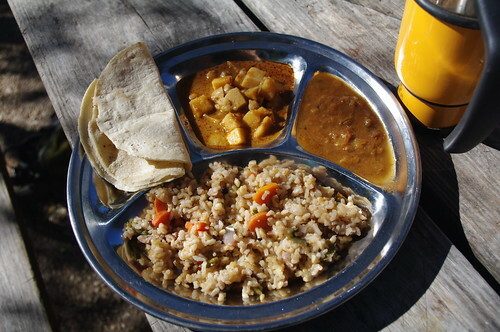 Then…voila – delicious, instant gourmet Indian thalis while camping! Packaged food really doesn’t get much better than this. 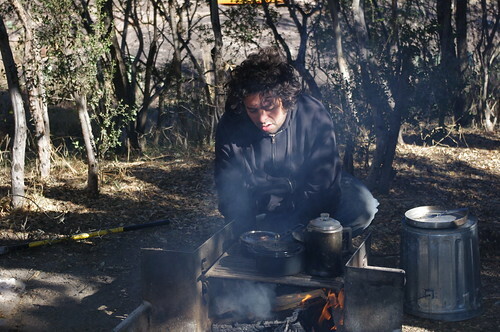 To make something comparable while camping, we’d have to carry around a bunch of veggies, curry leaves, loads of spices, a few different pots and pans, and spend at least an hour hovering over the campfire to cook it all. Instead, we were able to whip up this fancy plate of food in less than 10 minutes. I’m also so glad Tasty Bite specializes in Indian food. Indian food is something I absolutely love, always crave, but have a hard time replicating – especially while on the go. Not to say that packaged Indian food will ever compare to fresh, home cooked food in India, but Tasty Bite’s Indian dishes are full of flavor! And the ability to throw a few packages together and prepare a gourmet Indian meal in minutes? Wowee. This Tasty Bite stuff is quite the innovation. I’ll be bringing some Tasty Bite packages with me on my next camping trip. i’m really glad i stumbled upon your blog! while i’m by not vegan, i am vegetarian and i love eating vegan foods/”playing” vegan from time to time. I’m also Indian so i’m curious to try these options now! I adore TastyBite stuff! My favorites are the Bengal Lentils and the Chana Masala. 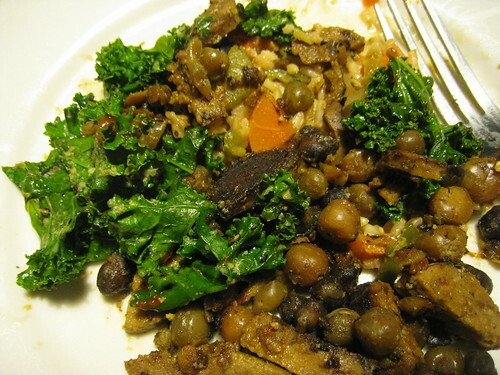 I usually put them over rice but I love your idea of using steamed veggies, especially kale. I need more kale in my life! PS: I’m happy to see that you live in TX. My husband wants to relocate there and I had no idea how familiar they are with vegans. You seem to do well and give me confidence for us!